Distribution and habitat: Sagittaria subulata is native from South America can grows to a height of 50cm (20 inch) when it grows older. In the aquarium it sometimes sends a long flower stem to the surface and small white flowers unfold just above the water surface. In its natural habitat grows in rivers; it is found in both freshwater and brackish water. Description: Sagittaria subulata is a grass-like plant with leaves only 5mm (0.2 inch) wide. These are bright green, with acute or rounded tips. 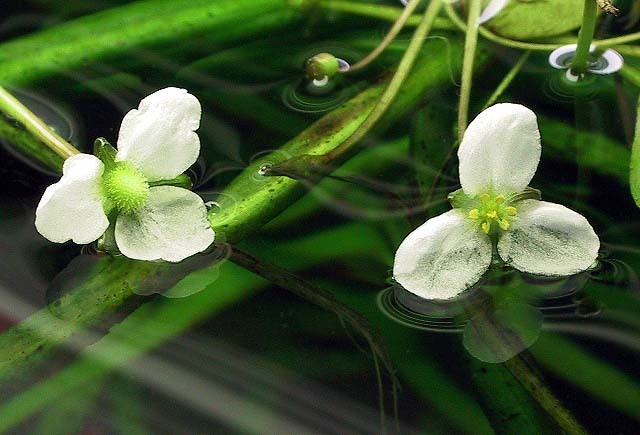 In shallow water, small floating elliptical or egg-shaped leaves are produced, followed by small white flowers. It is a fast-growing species, which displays productive multiplication through runners, which will form a dense, about 5-7cm (2-2.8 inch) thick cover within a few weeks. Sagittaria Subulata species have long and narrow leaves when kept under water (Arrowhead shaped). 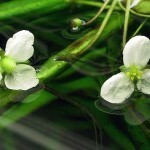 Care: Sagittaria subulata is an easy, undemanding fast growing plant. This plant can be grown in its emersed or submersed form. If grown emersed, its leaves are somewhat thicker than when grown immersed. At one point pruning must be done because the plant develops runners that are too close from each other and Sagittaria Subulata will have the tendency to climb to look for light and space. Water: Water parameters are not really an issue as this plant seems to do great in any conditions, even quite hard, alkaline water conditions. Sagittaria subulata grows best in medium-hard to hard water with a pH-value within the moderately acid to alkaline range. Light: Sagittaria subulata require moderate to strong light. Intense lighting will bring out reddish leaf apexes. Temperature: Optimum growth temperature for Sagittaria subulata is 18 to 26°C (64 – 79°F), but it can withstand temps from a very low 15°C (59) to 29°C (84°F). Sagittaria subulata seems to be not sensitive to temperature change. Fertiliser: Add fertilizer on a regular basis as important factor for this plant to thrive. Substrate: Fine-graveled sand is best for these delicate plants. Propagation: They propagate by sending runners everywhere around the mother plant. With a good substrate (rich in Iron), added CO2 and a strong lighting, this plant will grow very quickly to cover the bottom of your tank. Problems: The plant leaves will become yellowish if proper conditions are not met (especially if it lacks Iron). Uses: Sagittaria subulata is used in aquariums as mid-ground or foreground plant. Planted as a standalone this aquarium plant can be striking. Sagittaria Subulata var. pusilla, the smallest Sagittaria subulata, growing up to 30cm (12 inch). Sagittaria Subulata var kurziana which grows up to 50cm (20 inch). Sagittaria Subulata var gracillima, the tallest Sagittaria subulata, reaching up to 60cm (24 inch). 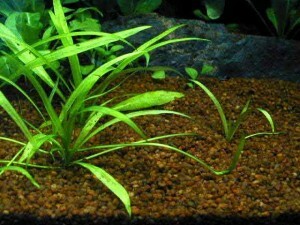 Interesting facts: Sagittaria subulata is often confused for Vallisneria species.